Area woman last seen in Washington C.H. A flyer with information on Hanna Geiger’s disappearance is being distributed on social media. A 20-year-old area woman has been reported missing and was reportedly last seen in the Washington Court House area. Hanna Geiger is described as five feet, five inches tall, 115 pounds with brown eyes and brown hair. According to a flyer shared by local law enforcement on social media, Geiger has been missing from the Columbus area since March 5-9. The Fayette County Sheriff’s Office is assisting the Columbus Police Department in the search. According to the flyer, Geiger’s last credit card use was March 9 in Washington C.H. Calls made to her cell phone reportedly go straight to voicemail. Her vehicle is described as a 2006 Honda Civic four-door with a silver to tan color. The “H” Honda emblem is missing on the front and the license plate holder is from a dealer in Mansfield. The Ohio plate number is HDH9323. According to the flyer, Geiger’s usual hangouts are Chillicothe, Washington C.H., Grove City, and the Powell/Worthington area. 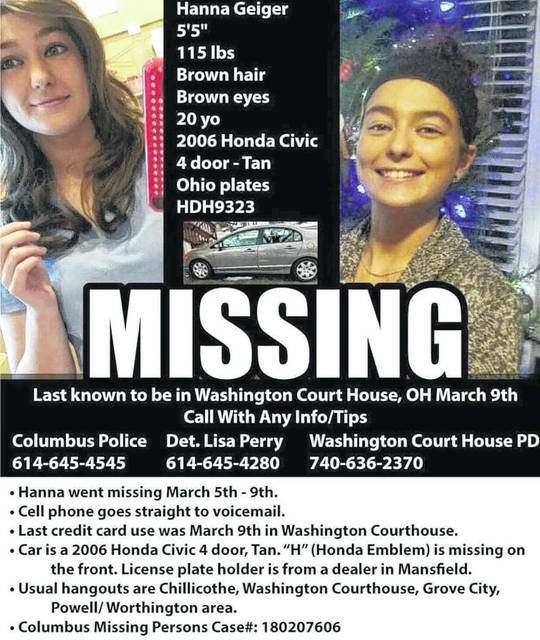 Those with any information concerning Geiger’s disappearance or her current whereabouts are asked to call the Columbus Police Department at 614-645-4545, Det. Lisa Perry at 614-645-4280, the Fayette County Sheriff’s Office at 740-335-6170, or the Washington Police Department at 740-636-2370. A Facebook page entitled “Finding Hanna Geiger” has also been created to assist in locating Geiger. https://www.recordherald.com/wp-content/uploads/sites/27/2018/04/web1_29791291_1881097095274688_3963369995110449152_o.jpgA flyer with information on Hanna Geiger’s disappearance is being distributed on social media.